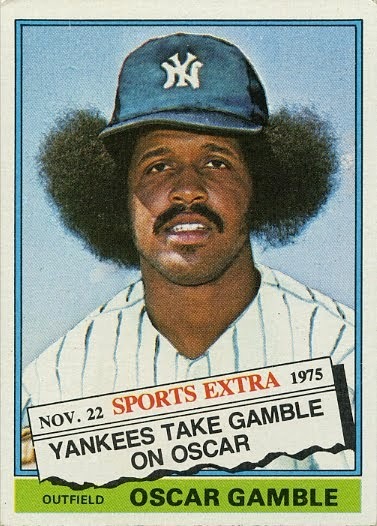 I've been building my Oscar Gamble player collection for a good year and a half now and it's been a really fun chase. Most of the cards are cheap base cards and even the autos and tougher inserts are quite reasonable (compared to the Linden Tax I pay for my other pc). Recently the challenge has been stamped redemption cards. Tough to track and exciting to land. I've gathered a good little collection of them and they've really filled in the bottom portion of my master checklist. And while #WalletCard has been added in some new products this year it was my most recent discovery that has me pondering how I should move forward. 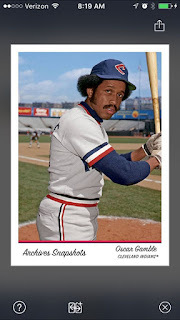 At first glance you might think this is the simple base card version of the Topps Archives Snapshots. A nice photo on a simple card design. Should be fun....right? Well, this is the "digital card" version. It's selling on eBay right now. So what would I win? A link or transfer of file I guess. No shipping fees....so that's nice. But could I really be happy with a digital card? I knew of the digital card craze with the Star Wars releases and some sports stuff but never really had it on my radar (seeing as my players didn't have a digital card until now). With this new revelation, I feel a little hesitant to jump in. Yeah, on a 0.99 cent base card I'm fine chasing one or two of them, but what if there was a magical red and yellow polkadot version /2....would I go after that? What would the asking price be? What would the demand be? After all....you don't physically get anything. Heck, this screenshot is no different from the "card" itself in my eyes. What's to say I wouldn't be just as happy keeping this scan for all of eternity? (ok....deep down...I would know that it wouldn't be the same). It's definitely created a dilemma that many have already resolved. Where do digital trading cards live in my hobby world? Right now.....they don't. But I have a good feeling that will change.